Congratulations to our smallest graduates! Curiosity Corners Preschool celebrated the end of their school year last week. Full steam ahead (literally)! We are busy preparing for our Appreciation Night dinner taking place this evening. The Culinary Arts students have been busy all week preparing a feast featuring gnocchi, porchetta, and many other delicacies! But they haven't been the only ones to lend a helping hand; The brisket served tonight was prepared with the help of our Building Trades students who constructed a smoker right in our parking lot! We also have some alumni in the house: Jasmine and Aaron have been here all week helping us prepare for the big night. We are excited to host all of our amazing students and families tonight. Northwest Technical Center wouldn't be the wonderful place that it is without the amazing students, parents, and guardians that make up our community! Where engineering, design, and English Language Arts meet! Our annual board game design competition is underway. Here, Engineering Technologies students pose with their game, "Tree Bucket". Paramedic Billy Smith, a supervisor from Amcare, spent time with our Public Safety & Fire Services students today as part of the Stop the Bleed Campaign - What everyone should know to stop bleeding after an injury. Every year, a crab apple tree graces the entrance of Northwest Technical Center with it's blooming beauty. Our Human Services students took notice. The last few days have been all about pedicures in Cosmetology I. Practice makes perfect! Our Medical Professions II students were joined by Jill Berry Bowen, CEO of Northwestern Medical Center, and Dr. Fontaine, Director of Lifestyle Medicine, in a discussion of current issues and trends in healthcare. Together, they brainstormed the importance of wellness and preventing disease in our community. Northwest Technical Center Building Trades students met with Governor Scott yesterday and helped him declare May 16th Careers in Construction Day. The aim of the day is to bring awareness of the jobs available in the construction industries. Our Curiosity Corners Preschool friends spent some time observing bumble bees this morning! The preschool is an important part of our Northwest Technical Center family, serving as a lab for our Human Services students and providing quality child care for the tiniest members of the St. Albans community. Last night, we recognized 32 students newly inducted into the National Technical Honor Society. We also honored 19 returners. We are very proud of these future community leaders! Today, the Cosmetology I class welcomed a guest presenter from Pretty in a Minute! Drew Suza taught us about the materials hot tools are made from, the good and the bad, and demonstrated different types of styling techniques! He also emphasized the importance of staying “teachable” in this ever growing industry. Today we broke ground on our new Culinary Pollinator Rain Garden! With grant funding from the STEM Challenge Initiative and the New England Grassroots Environment Fund, and collaboration with Heald Funeral Home, the garden will include 26 kinds of berry bushes, 23 species of perennial culinary herbs and vegetables, and 23 species of perennial flowers. We will be posting updates so you can watch our garden grow! Our Human Services and Public Safety &Fire Services classes are engaged in Umatter training this morning. The objective of suicide prevention is to remove the stigma associated with suicide and mental health issues so that people will be more likely to seek help when they need it. We would like to thank Katie Mable and Lance Metayer from Northwest Counseling for providing our students with this opportunity. Today was a great day for foraging! Our Culinary Arts students went out in search of edible treasures. We didn't find much, but we did learn a lot! Any secret spots for mushroom gathering we should be aware of? Cosmetology II students had an opportunity to practice giving (and receiving) Facials yesterday. It's a beautiful day to practice ladder skills with a 24 foot extension ladder! Our Building Trades students have been working hard to complete this storage shed that was delivered to it's new home today - the Missisquoi Valley Union baseball field! Did you know that MVU is one of Northwest Technical Center's two sending schools? That's right - we are not just the "BFA Tech Center"! We love collaborating with both of our sending schools. Today Chief Baker returned to our Public Safety Fire Services class to process the results of our students interview skills. Chief Baker discussed what the students did well and areas of improvement for future interviews. We are very lucky to have our local partners help our students with skills needed to be successful in today's world of work. Mr. Antoniak and our students would like to thank Chief Baker for taking time out of his busy schedule to help us with these important skills. Yesterday was Tech & Engineering Day @ Northwest Technical Center! We had a great time hosting around 165 students from Fairfield Center School, Missisquoi Valley Union, St. Albans City School, and St. Albans Town Educational Center. The 6th-8th grade students competed in a series of STEM related challenges and showed great innovation and drive! Congratulations to all of the medal winners! Special thanks to BFA, St. Albans and STEM Challenge Initiative for partnering with us to host this fabulous annual event. Good luck to all of our students participating in SkillsUSA today! These students truly are the leaders of tomorrow! Presentation matters! NWTC students are busy preparing for the upcoming SkillsUSA competitions. With some help from our Cosmetology students, Culinary Arts student Sebastian ensured that his hands were in tip top shape for his Food Service competition in Montpelier this weekend. Check out this wonderful opportunity for rising seniors to work on their college and scholarship essays with Mr. K this summer! The Cosmetology II students are working on The Law of Color and learning the color wheel. Today, they worked with guest instructor Tyler Hermanson from Williston, who has been leading painting classes for over 5 years. Students spun the color wheel to decide what colors each of them would use on their canvas. They then had to use complementary and contrasting colors to create a image that fit together as one. Thank you for the great, hands-on lesson Mr. Hermanson! Did you know that February is Career & Technical Education (CTE) Month in the state of VT? There are many amazing CTE centers all over our beautiful state. Northwest Technical Center is proud to be a part of such an inspirational group of schools. Career & Tech Ed deserves to be celebrated! Congratulations to Joseph Wills, an Engineering Technologies student at Northwest Technical Center. Joseph is a 2018 U.S. Presidential Scholarship nominee representing Vermont! Celebrating the last school day of 2017 with guest speakers, food, sweets, and festive sweaters! Have a nice winter break, everyone! See you in 2018! As part of his Co-operative Education placement, Public Safety & Fire Services student Samual Hayford had the opportunity to participate in "Coffee with a Cop" at Walmart last Friday. What a wonderful way to spread good will! Last month, our Cosmetology students attended the Cosmetology in Action Student Hair Show in Nashua, NH. Students competed in an updo mannequin competition, met with salon vendors, post secondary schools, and observed classes. They also toured Micheals School of Design and Paul Mitchel School in Bedford, NH. 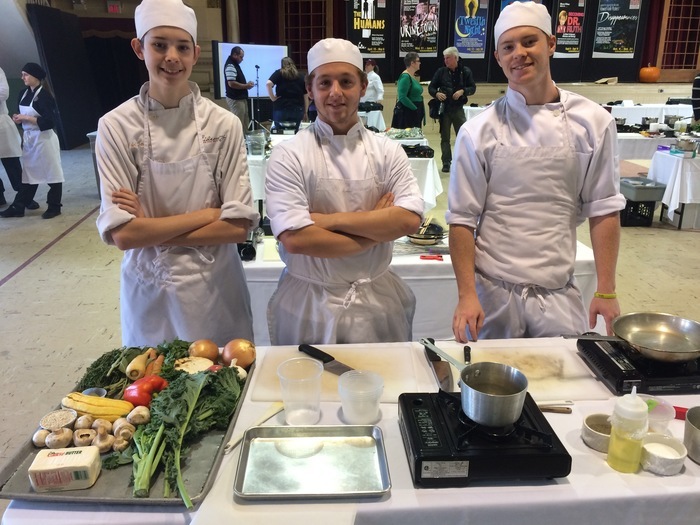 Congratulations to Matthew Tracy, Xavier Shover, and Issac Shover on their second place finish at the NECI Culinary Classic! Each of our students was awarded a $2000.00 scholarship to the New England Culinary Institute and a knife kit provided by Mercer Cutlery. Our Culinary Arts and Digital Video Production students came together today to showcase and capture the artistry of plating. We had a great time helping 8th grade MVU students discover some career options today! Our Digital Video Production students visited WCAX last week. What a great opportunity to witness first hand what goes into news production! Our Cosmetology students visited the O'Briens Aveda Institute this afternoon. Thank you for the goodie bags! Did you know that Corporal Will Furnari, our School Resource Officer (SRO), initially went to college to study nursing? Here he is showing our Medical Professions II students how it's done! Mr. Capsey teaching a lesson about saws in Building Trades. Nothing beats a 7th period scalp message. You can learn how in our Spa Magic class - a one period, Specialty Module elective. The Hideaway, our student run restaurant, represented the Northwest Technical Center at the Fine Wine, Food & Beer festival this weekend. Were you there? Car talk with Mr. V. on this Friday morning. Learning about educational theory today in Human Services. Medical Professions students are measuring Ph levels in their spirit wear this morning. Check out the smiling faces of our brand new Culinary Arts students!